There's no need for a synopsis on this one. If you don't know the story from the book or movies by now, well...what are you waiting for? I re-read this in anticipation of the upcoming movie. It's too bad I'm not a night owl or I'd be tempted to see the movie at midnight tonight. As it is, I'm not sure when we'll be able to go. I'm ready to see it. I've probably read this book 3 times now. 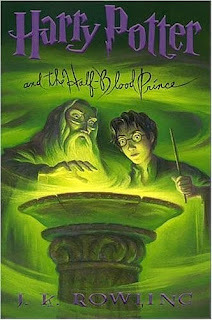 It's not my favorite HP book (not sure which one is) but it's still a hugely enjoyable read. Funny though, after multiple readings I'm starting to pick up on flaws (at least to me) in the story and/or writing. After this reading I was puzzled by why all the characters decided to stand around and recount the events surrounding Dumbledore's murder by Snape (C'mon, if you didn't know by now...where have you been...the moon?) rather than be caught up in the vast grief of the event. Too much exposition, too little grieving. But, I nitpick. The Harry Potter books have been some of the most enjoyable reading I've done over the last few years. I'm sorry that it's over. I think I might move directly into Deathly Hallows since I've only read it once. And then, I'm sure I'll read it again before the movie(s).